Leaving home, new classes, new friends and new activities, it can be a lot to handle. 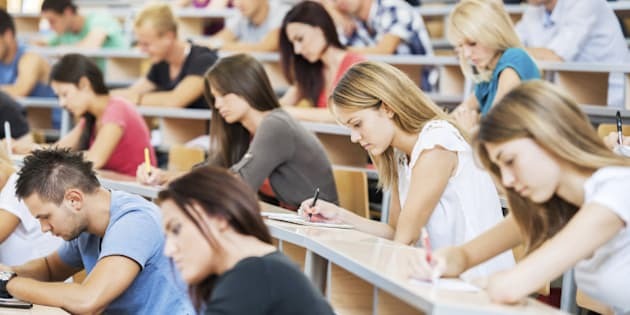 While attending post-secondary school is an exciting chapter in anyone's life, it can also be a transitional period for students experiencing it all for the first time. Students all over Canada are adjusting to their first year of university or college. Leaving home, new classes, new friends and new activities, it can be a lot to handle. While attending post-secondary school is an exciting chapter in anyone's life, it can also be a transitional period for students experiencing it all for the first time. Moving out on your own is exciting and full of opportunities, but at times it can be lonely. Clinical psychologist Dr. Christopher Thurber co-produced a study on homesickness in university students, and found that while all students miss something about home when they're away, 5-10 per cent of post-secondary students develop intense homesickness, which has an effect on behaviour. Homesickness isn't the only threat to first year students' mental health. Students have to deal with a more demanding curriculum, adapt to new roommates, new classmates and learn how to take care of themselves for the first time ever. I remember the culture shock I experienced during my first few weeks of classes at York University, and that was back when university wasn't as expensive, programs were less competitive, and moving away from home was not the thing to do! Students who choose to live at home during post-secondary schooling are not exempt from mental health issues either. While staying home saves students and families from the financial burden of accommodation, it can be challenging to watch friends go off and start a new life while they remain at home with their parents who may still treat them as children. Mental health issues in universities and colleges are not new. Why do you think Reading Week was introduced? It was created in the 1960s to allow students a reprieve from their demanding curriculum. Since then, mental health issues have grown exponentially. In 2011, Ryerson university's centre for student development and counselling found that there was a 200 per cent increase in students reporting a crisis situation. I was initially shocked by this statistic, but a Maclean's report about mental health on campus provided some background on this issue. They found that more students are enrolling in school with previous mental health issues than ever before, and now these existing issues are being intensified. We developed The Student Assistance Program (affectionately known as SAP) at Aspiria to augment what schools are currently providing to assist students seeking help with their mental health on campus. Our goal is to help students thrive while at school and build resiliency skills to prepare them for graduation and the workforce. Attending college or university certainly has its challenges for students, but it's important to remember that the experience is also exciting, rewarding, and will help shape who they become in life. • Parents should encourage their children to work summer jobs to create a sense of independence and responsibility they will carry with them to school. • If students are moving away for school, it's important to familiarize yourself with the campus prior to starting classes. This will allow for less of a culture shock when school begins. • Join clubs and social groups. Clubs are a great way to meet friends and people who have similar interests. International students can find other students who have recently moved to their campus. • Seek help with the school's counsellors or find out if a SAP is offered. These programs are in place to help students address their mental health issues and are always accessible. First year on campus can be a difficult adjustment for students. What additional strategies can you think of that can make the transition to campus life easier for students?